The idea of keeping the pH balance of the body in check is becoming more and more accepted as a way of optimizing health and guarding against degenerative conditions. pH balance supplements can help with this goal. Everything we eat has a pH level and can be broadly categorized as acidic, alkaline or neutral. The vast majority of foods we eat in the modern western diet are acidic in nature whilst the very healthy foods that so many of us fail to eat enough of (e.g. fruits and vegetables) are alkaline. The ideal pH for a human is slightly alkaline - around 7.4 on the pH scale. As a result of our diets, most of us are at least slightly acidic instead. Having our pH out of balance like this and being in an acidic state, makes us far more susceptible to disease and illness. Cancers, viruses, fungii, inflammation and bacteria all thrive in acidic environments. The good news is that we can correct this imbalance through modifications to our diet and supplement intake. An increase in the consumption of alkaline forming foods and consumption of suitable pH balance supplements can help rebalance the body. 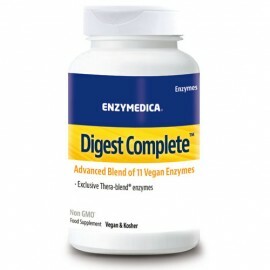 Enzymedica pH-Basic is designed to maintain the body’s optimal pH level. It contains a synergistic b..